Tool for fast multiple attribute connecting. Create locator on Nurbs Curve. 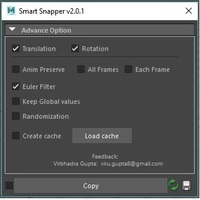 Smart Snapper is script for animators. It copy global position of object and use it to create hold or offset. Set and forget your playblast settings while animating! Struggling with image planes? Simple, yet powerful UI to import, move and mange imageplanes in your Maya scene. Like the name suggests, this will key only your channels which are already keyed. Joint Divider mel script can divide or split your joint as many as you want. GUI window for setting transform limits, locking and hiding channels. BakeFactory can help you to simplify and speed-up baking process. Easy to use an animation tool that increases FPS up to 10 times. 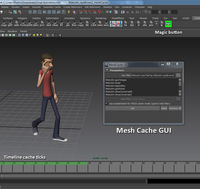 Works in all Maya versions. This is a MEL code for viewable renderings and time adjustments with one click that saves your renders as you view them happen. Easy way to do camera shake using the shake attr.